How Would Todd Lamb Govern? If Gov. Mary Fallin joins President-elect Donald Trump’s administration, Lt. Gov. Todd Lamb will step in to finish the two years left in her term. The question is, would that mean status quo in policies since both are Republicans, or would Lamb’s half-term, combined with a big crop of new legislators, bring significant changes? Lamb, an Enid native and former Secret Service agent, would become governor at a challenging time for the state, with another sizable budget shortfall expected for fiscal 2018 and state agency heads describing their funding needs in crisis terms. The Legislature and governor will face growing pressure to raise teacher salaries, reduce prison overcrowding and address health issues, among other things. Lamb, 45, has been lieutenant governor for six years and previously was a state senator for six years. In his current job, he has traveled the state extensively, speaking to civic groups and talking up economic development. But Lamb is still an unknown quantity to many Oklahomans. A SoonerPoll survey in July found that nearly half of respondents didn’t know or had no opinion of Lamb. By comparison, 6.4 percent said the same about Fallin. Lamb’s voting record, public statements and campaign finance reports do offer a glimpse of what positions and approaches he might take regarding key issues in the state. He is expected to run for governor in 2018 regardless of whether Fallin leaves office early. Other possible gubernatorial candidates mentioned in political circles are Attorney General Scott Pruitt, a Republican, and Democrat and House Minority Leader Scott Inman. Earlier this year, Lamb became one of the first high-profile state figures to come out against State Question 779 – the failed proposal that would have funded a $5,000 teacher pay hike and other education programs by increasing the state sales tax by one cent. In June, Lamb told the Edmond Area Chamber of Commerce that he supports the concept of teacher raises and that “more money must go to the classroom.” But he said the plan wasn’t equitable because new and veteran teachers would get the same increase. Like Fallin, Lamb has been a strong supporter of school choice and the use of taxpayer dollars for school vouchers. Earlier in the year, he joined the governor in calling for the passage of a House bill that would set up educational saving accounts, allowing parents to use state funds to help pay for enrolling their children in private schools. The bill failed to pass after it was criticized by school boards and other public school advocates. In terms of higher education, Lamb could try to improve the relationship between colleges and universities and the Legislature, which voted last session to cut higher-ed funding by 16 percent, partly in response to University of Oklahoma President David Boren’s support of the sales tax. In the past, the state Board of Regents has honored Lamb for pushing for more funding for colleges, and as lieutenant governor, he has spoken at many higher education institutions around the state. His messages about higher education have often been couched in terms of economic development. But whether that support would translate into a push for higher or level funding for colleges during lean budget times is unclear. During his campaign for lieutenant governor, he said he would work to reduce taxes so “more Oklahoma families and businesses can keep more of what they earn and our state can prosper,” according to his campaign website. Lamb, who also serves as small business advocate in the governor’s cabinet, also supported legislation over the years to provide incentives for businesses. 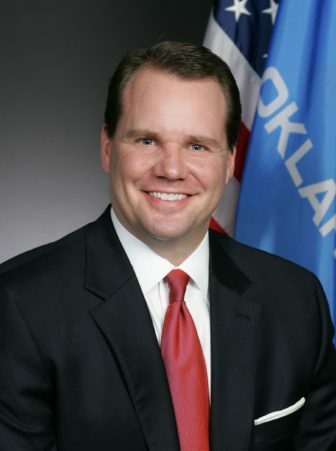 As a senator, he pushed for tax credits for the aerospace industry and co-authored the Oklahoma Community Economic Development Pooled Finance Act of 2009. The pooled-finance program, which has helped fund plant expansions and equipment purchases for at least 17 firms, will eventually reduce state tax collections by $89.2 million, according to a 2015 Oklahoma Watch investigation. Critics have said companies are benefiting from a “sweet deal” during a time when the state faces severe revenue shortfalls. Earlier this month, The Enid News & Eagle reported that Lamb told local business leaders that he supports a review of current state incentives and that future incentives should have a sunset date so lawmakers can evaluate them. Like many other candidates in Oklahoma, Lamb has also received a number of campaign contributions from oil and gas groups. Since 2004, he has received more than $84,600 from companies or groups associated with the energy industry. During his 2014 campaign, he received donations of $5,000 each from ConocoPhillips, Devon Energy, Exxon Mobil, Marathon Oil, Valero Energy, BP North America, Williams Companies, Chesapeake Energy, ONEOK, NewField Exploration Co., Spectra Energy, Phillips 66 and Unit Corp.
With the future of the Affordable Care Act in question as Donald Trump takes over the presidency, look for Lamb to oppose the law as it’s currently written. He has repeatedly spoken out against the act and, as a member of the Senate, opposed efforts for Oklahoma to expand its Medicaid program. Lamb, who is a church deacon at Quail Springs Baptist Church, has taken conservative stands on some social and religious issues. As a legislator, he backed or introduced several bills designed to limit or restrict access to abortions. One bill that he co-authored and that was approved required women to view an ultrasound before having an abortion, but the law was challenged in court and eventually was overturned. Lamb also supported this year’s State Question 790, which would have repealed a section of the state constitution that prohibits the government from using money or property for religious purposes. In an opinion piece for the Tulsa World, Lamb wrote that the proposal was needed to allow faith-based groups to compete for state funding. The ballot measure failed, with 57 percent of voters opposed. Attorneys in Oklahoma’s opioid lawsuit have bragged that they slept on cots in their offices and went through millions of pages of evidence. But one private attorney in the case, a former legislative leader, stands to make $5.6 million in the recent settlement against a drugmaker despite having no obvious role documented in court filings.